In Italy during the advance by the Commando to its final objective, Corporal Hunter of "C" Troop was in charge of a Bren group of the leading sub section of the Commando. Having advanced to within 400 yards of the canal, he observed the enemy were holding a group of houses South of the canal. 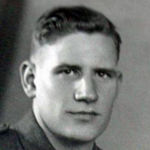 Realising that his Troop behind him were in the open, as the country there was completely devoid of cover, and that the enemy would cause heavy casualties as soon as they opened fire, Corporal Hunter seized the Bren gun and charged alone across two hundred yards of open ground. Three Spandaus from the houses, and at least six from the North bank of the canal opened fire and at the same time the enemy mortars started to fire at the Troop. Corporal Hunter attracted most of the fire, and so determined was his charge and his firing from the hip that the enemy in the houses became demoralised. Showing complete disregard for the intense enemy fire, he ran through the houses, changing magazines as he ran, and alone cleared the houses. Six Germans surrendered to him and the remainder fled across a footbridge onto the North bank of the canal. The Troop dashing up behind Corporal Hunter now became the target for all the Spandaus on the North of the canal. Again, offering himself as a target, he lay in full view of the enemy on a heap of rubble and fired at the concrete pillboxes on the other side. He again drew most of the fire, but by now the greater part of the Troop had made for the safety of the houses. During this period he shouted encouragement to the remainder, and called only for more Bren magazines with which he could engage the Spandaus. 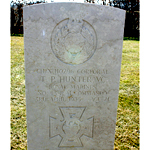 Firing with great accuracy up to the last, Corporal Hunter was finally hit in the head by a burst of Spandau fire and killed instantly. There can be no doubt that Corporal Hunter offered himself as a target in order to save his Troop, and only the speed of his movement prevented him being hit earlier. The skill and accuracy with which he used his Bren gun is proved by the way he demoralised the enemy, and later did definitely silence many of the Spandaus firing on his Troop as they crossed open ground, so much so that under his covering fire elements of the Troop made their final objective before he was killed. Throughout the operation his magnificent courage, leadership and cheerfulness had been an inspiration to his comrades." 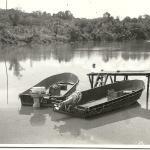 42 Commando RM Borneo and Singapore (15).